Swiss wheelchair racer Marcel Hug says he is relishing renewing his rivalry with Britain's David Weir at this weekend's IPC Athletics Grand Prix. The pair will meet on the track for the first time this season in Nottwill, Switzerland, after Hug beat Weir to win last month's London Marathon. "It is great to compete against him. He is a big challenge for me," Hug, 28, told BBC Sport. "This weekend is a new chance for both of us." 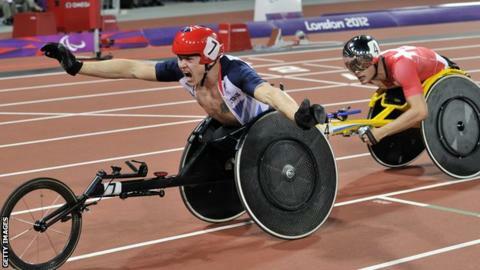 Weir proved unstoppable at the London Paralympics, winning four golds in the T54 800m, 1500m, 5000m and marathon, with Hug taking two silvers. But after the Briton took a break from the sport last year, missing the World Championships in Lyon, Hug took full advantage. He won five golds in France in distances from 400m up to the marathon. And the Swiss racer, known as the 'Silver Bullet' because of the colour of the racing helmet he wears, showed that he was still the man to beat on the streets of London, denying Weir a record seventh win in the race in a sprint finish. The Nottwill meeting, which runs from Friday to Sunday, will also feature Australian Kurt Fearnley and Canada's Josh Cassidy, who will provide a stern test for Hug and Weir. British Paralympic champions Mickey Bushell and Hannah Cockroft are also competing at the event. Hug knows that the rivalry between Weir and himself, which will continue at August's European Championships in Swansea, is one that both of them relish and is key to the profile of the sport. "We are both absolutely focused and as athletes we are pushing each other. We talk a lot off the track but we aren't close friends because we are still rivals," he said. "I understand that he needed a break after London. It was a big success for him and sometimes you need a break mentally. "I won medals last year when he wasn't there but there is nothing I can do about that. I have to live with it but I still had to beat good rivals."